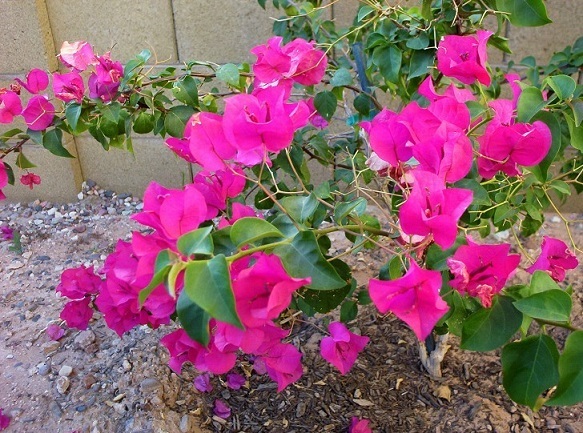 Bougainvilleas are a great landscape plant for Phoenix. They are somewhat tender but recover easily from frost damage. Once established, bougainvilleas are fairly drought tolerant and to spite their lush look only need periodic deep soakings. Barbara Karst, shown below, is the best bougainvillea variety for Phoenix because it blooms all year and takes the heat better than other varieties. Its blossoms range from purple to violet to pink depending on weather conditions. Since bougainvilleas are tender right at the freezing point they are a great indicator plant for growing other tropicals. If the bougainvilleas in ones yard take very little to no damage during the coldest days of winter then tender plants such as plumerias and mangoes can most likely be grown outside.